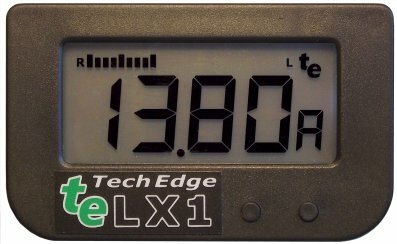 LX1 is a backlit LCD digital display used to display the AFR/Lambda and other parameters collected by a Tech Edge wideband Controller. 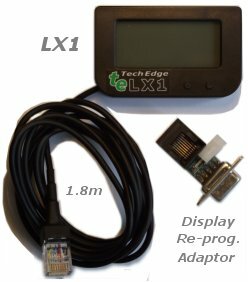 Tech Edge sells other displays, but LX1 is the one we recommend for most applications. LX1 User's Guide. Being LCD, LX1 works by reflecting ambient light during the day, and uses its backlight at night for a soft, easily readable effect (see below for more images). It does not suffer the "washed out" effect seen on most other displays that use LED (like most other wideband displays). LX1 is designed to be viewed from above and this also enhances its readability as ambient sunlight will be reflected downward rather than appearing as glare. LX1 shares many of the features of LD02 and LA1. Note: LX1 is not available in DIY form. LX1 is not waterproof but can be used in the open when appropriately protected. Go here for the LX1 User's Guide - it describes how LX1 displays more than just AFR/Lambda and includes all the wideband status information it can report. 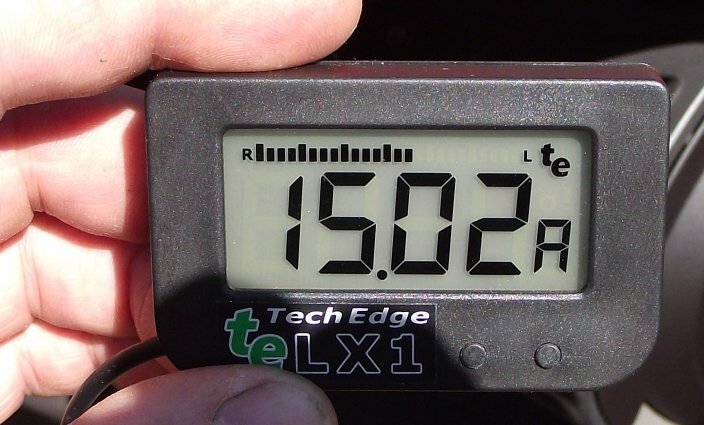 LCD technology - Can be used in direct sunlight where other LED displays "wash out". Backlit - Looks great at night too with a soft blue/white hue. Thin - 13 mm (½"). Attach it to your dash with Velcro™ or double sided tape. Big display area - 45 x 20 mm (about 0.8 x 1.8") - easily read at a distance. Small Case - 68 x 42 x 13 mm - not much larger than screen. Configurable - displays real-time data collected by WBo2 with 4 "views". Firmware upgradable - possible future upgrade and enhancements. 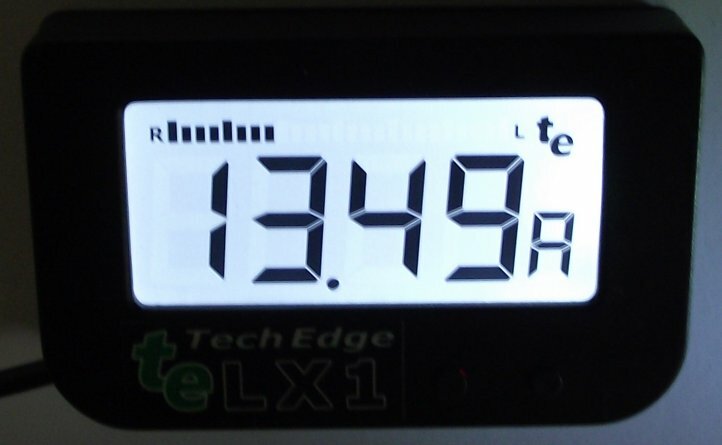 Accurate - Digital interface between wideband unit and LX1 for no loss of accuracy. Convenient positioning - The cord on the LX1 is 1.8m long, thin & fits in tight places. Note the high contrast shown in the three lighting conditions below (click to enlarge). 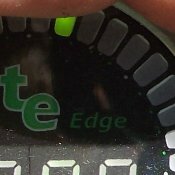 It is clear that the transflective LCD technology that Tech Edge uses gives very good visibility in all lighting conditions. Shown at left is an LA1 and LX1 under similar bright outdoor lighting conditions. Look closely at the LA1 - it is also reading the same as the LX1 but the LA1's display cannot be seen at all except for the green "dot" (see enlargement at right) that can only be just seen because the top part of LA1 display is in a shadow (note that the LA1 green LED vs. red LED brightness makes little difference when the display is washed out by ambient light). Yes, the LA1 looks more like a conventional gauge, and having an "analog" dot, it's easier to see small changes just by observing the dot move. But clearly, the LX1 is much easier to read. It's also easier to mount (use sticky Velcro™ that is available from many automotive outlets). Viewing Angle - viewed from "above", not "below"
The LCD screen, normally mounted vertically, has been designed to be viewed either perpendicularly or at a slight "looking down" viewing angle. This is the orientation normally chosen for gauges to avoid ambient reflections - note that this is opposite to the orientation of LCD screens used on common items like calculators that are designed to be laid flat. The image shows this effect. 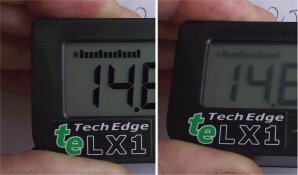 On the right side, the top of the LX1 screen is rotated away from the camera and it clearly shows a fuzzy image in comparison to the left side (laid flat). The LX1 case size is 68 x 42 x 13 mm (around 2.7" x 1.7" x 0.5"). The black case is made from high temperature ABS plastic. LX1 has two buttons (A=left and B) like our other displays. One button changes the view (up to 4 views available) and the other is used with our logging controllers to stop/start on-board logging. At left are shown the items you receive when you order an LX1. Note that the cable length is a long 1.8m. The plug is a standard RJ45 connector so a "network extension cable" could be used to extend the cable even further. 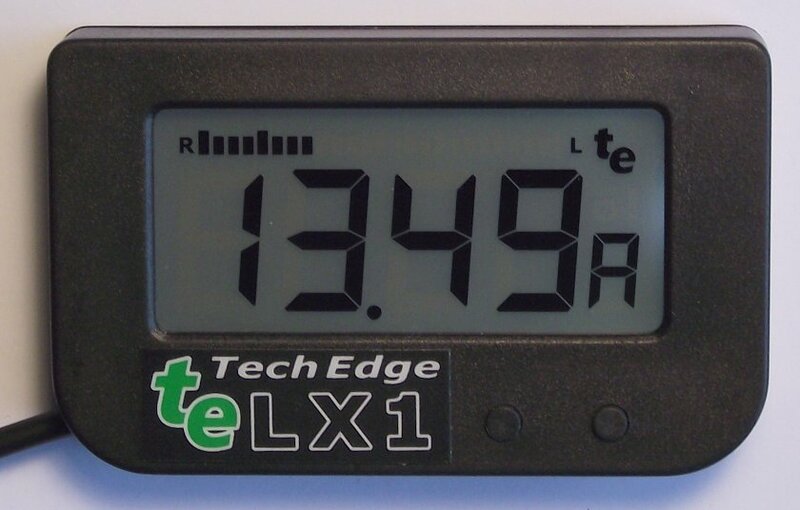 The LX1 plug connects directly to all Tech Edge wideband controllers - many controllers allow two displays to be connectd at one time. Shown below the LX1 is the reprogramming adaptor (also shown at right). This adapter is used to update the firmware and to configure the display for different functions. For more LX1 information, see the LX1 User's Guide.